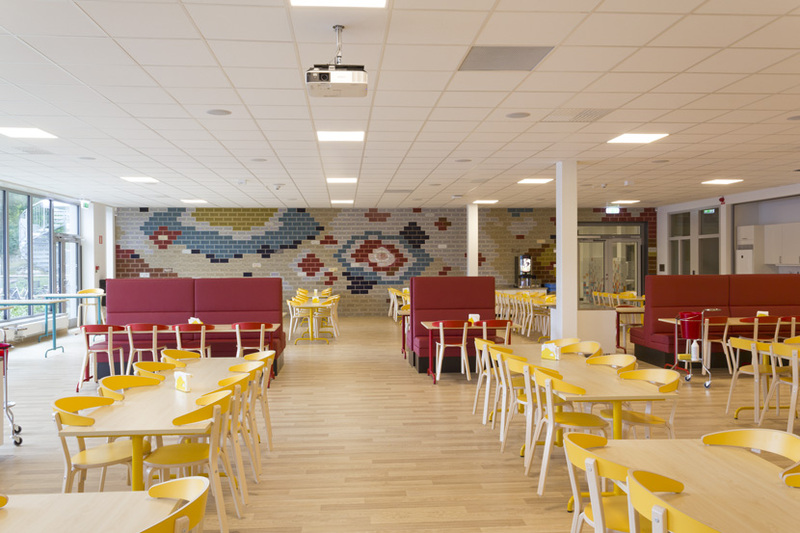 one of several installation views of the wall, 3 x 15 meters, made for the canteen in the new building of the school (pupils up to the age of 12). It was opened in August 2018. The wall is made of glazed and unglazed acoustic brick; mosaics (see details of separate mosaics) which repeat and play on the hole patterns of the bricks as well as ceramic elements (see details of separate ceramic plates), which also mimic the bricks, although without their holes. The construction/installation of the wall took place in February 2018, by bricklayer Dan Ahlgren, assisted by JS. The mosaic elements were made by cosmomusivo in Berlin, from JS' watercolor sketches. The ceramics were made by JS at the University for Applied Art Vienna. The title "Mitt i prick" is ambiguous to translate. It could mean "Dot in the middle", but also "Right on Target".